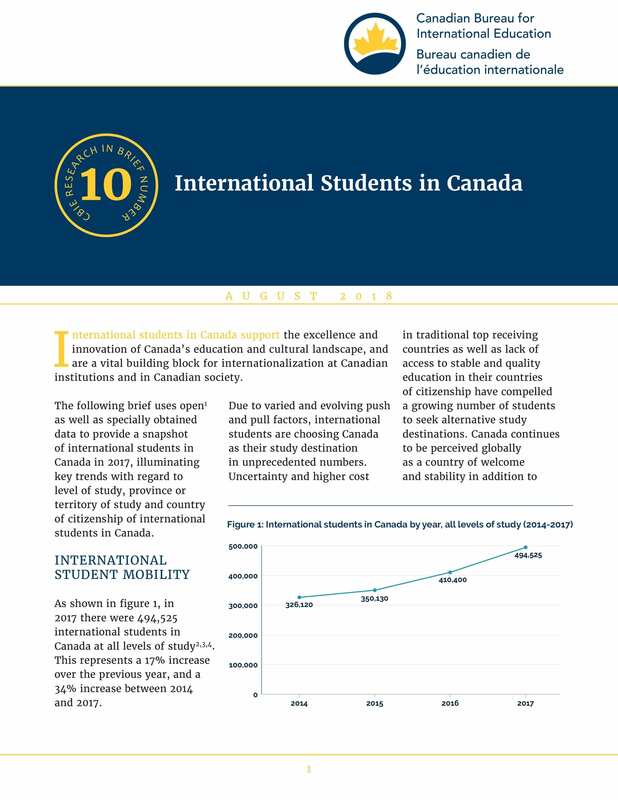 The following brief uses open as well as specially obtained data to provide a snapshot of international students in Canada in 2017, illuminating key trends with regard to level of study, province or territory of study and country of citizenship of international students in Canada. 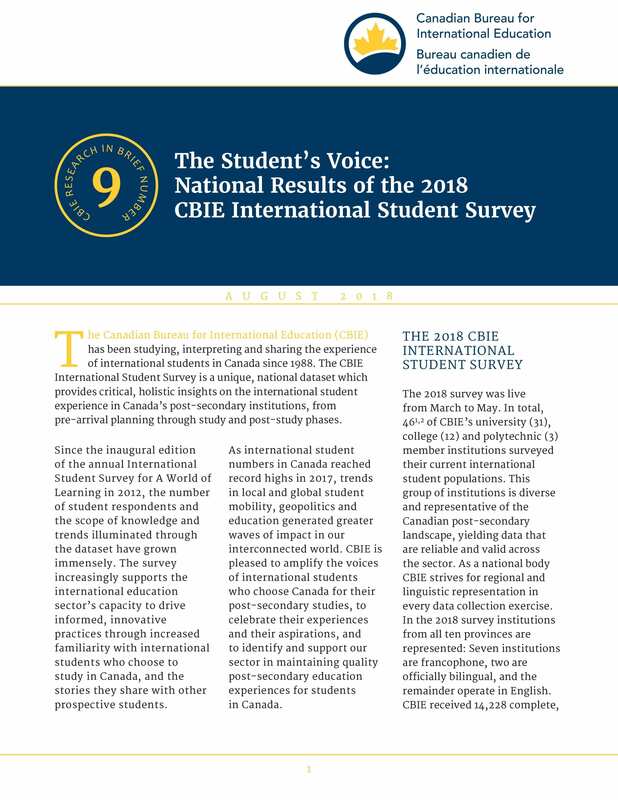 The CBIE International Student Survey is a unique, national dataset which provides critical, holistic insights on the international student experience in Canada’s post-secondary institutions, from pre-arrival planning through study and post-study phases. Canadian higher education and immigration are two compelling topics with which to question the nation-state as a given scale of policy inquiry. 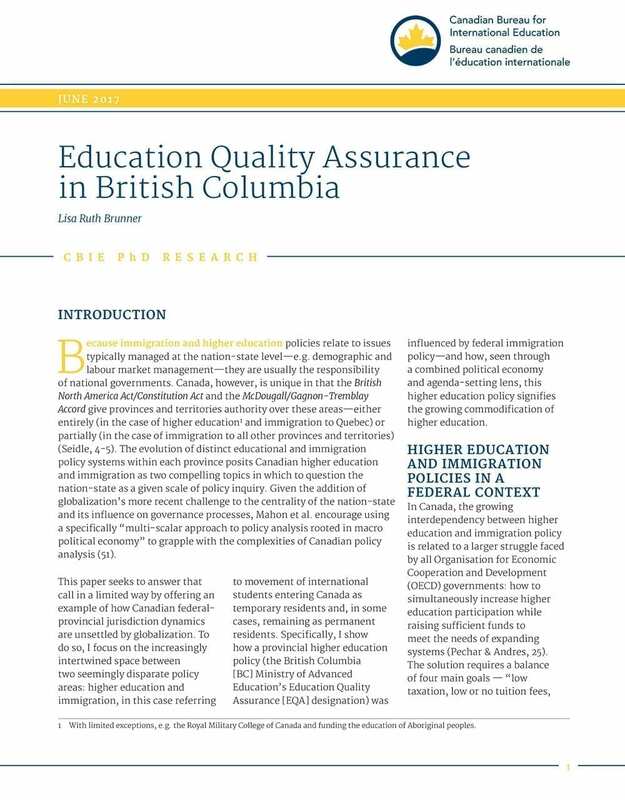 This paper offers an example of how Canadian federal/provincial jurisdiction dynamics are unsettled by globalization and shows specifically how the British Columbia [BC] Ministry of Advanced Education’s Education Quality Assurance [EQA] designation was influenced by federal immigration policy. Through a combined political economy and agenda-setting lens, this higher education policy perhaps signifies the growing commodification of higher education. 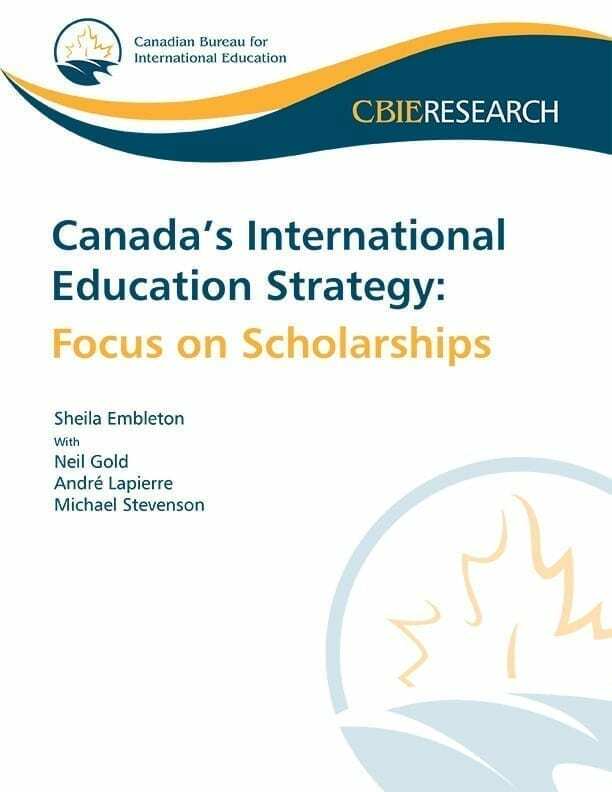 CBIE’s global report on international education in Canada. A large-scale survey on outbound student mobility participation, barriers and opportunities. In recent years, Ontario colleges have welcomed an increasing number of international students. 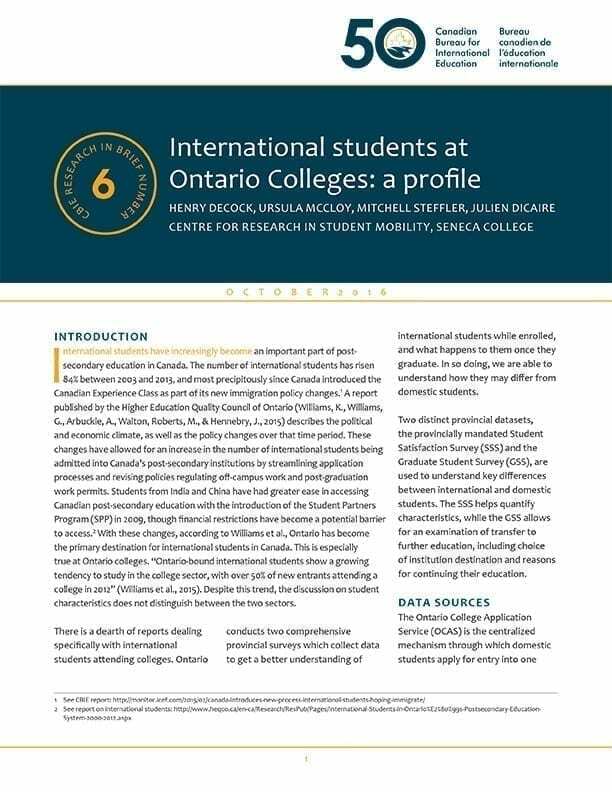 This paper offers a comparative analysis of international and domestic students in the Ontario college system, providing data insights on student socio-demographics, regional patterns, growth trends, and education pathways. 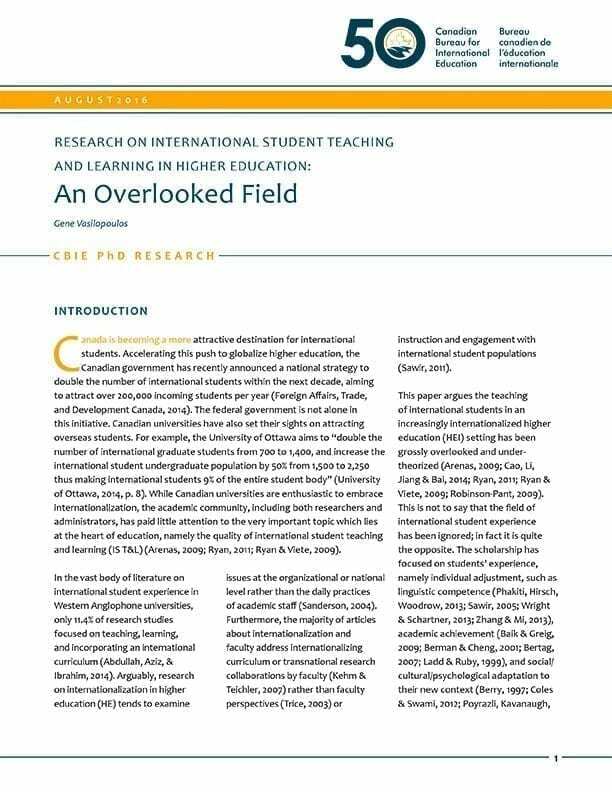 This paper argues the teaching of international students in an increasingly internationalized higher education (HEI) setting has been grossly overlooked and undertheorized. This is not to say that the field of international student experience has been ignored; in fact it is quite the opposite. The scholarship has focused on students’ experience, namely individual adjustment, such as linguistic competence, academic achievement, and social/ cultural/psychological adaptation to their new context. However, individual adjustment, including academic achievement, differs from teaching and learning and classroom processes of instruction and engagement. Few would question the role that instruction plays in learning, yet there remains a conspicuous gap in the scholarly research on the very important topic of effective teaching practices for an increasing international student population. The purpose of this article is to improve understanding of internationalization as a strategic response to the catalysts of globalization and the knowledge society. The paper will attempt to critically identify and interpret how the aforementioned elements are being recontextualized and translated into responsive internationalization policies and systemic institutional change. 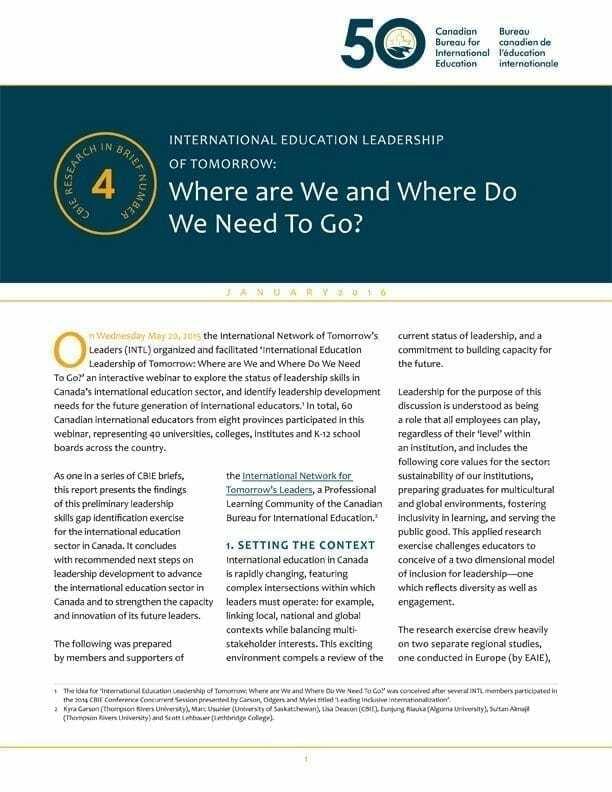 The article takes a critical analysis approach on current internationalization efforts and provides a conceptual framework for developing a performance indicator set through a combination of institutional change theory (North 1990) and the Delta cycle for internationalization (Rumbley 2010). Recommendations on future research areas are made at the conclusion of the article. 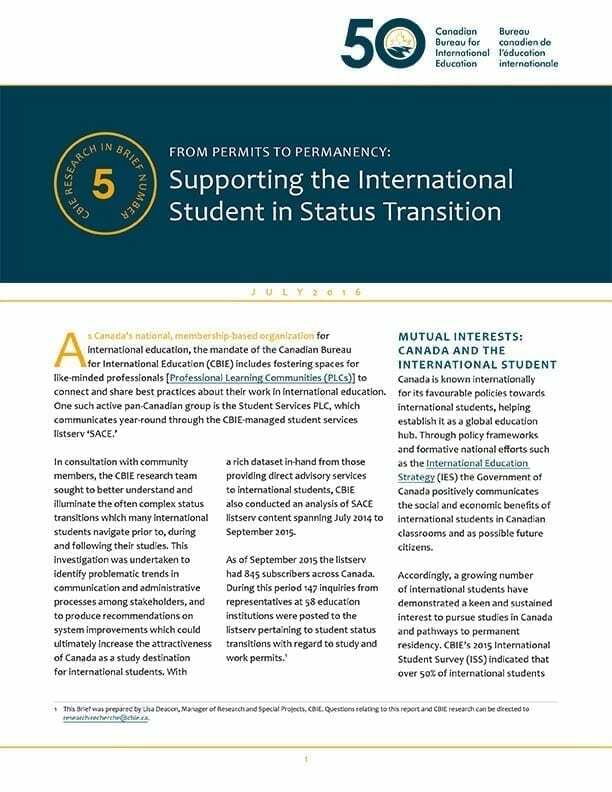 This paper seeks to better understand and illuminate the often complex status transitions which many international students navigate prior to, during and following their studies. INTERNATIONAL EDUCATION LEADERSHIP OF TOMORROW: Where are We and Where Do We Need To Go? As one in a series of CBIE briefs, this report presents the findings of this preliminary leadership skills gap identification exercise for the international education sector in Canada. It concludes with recommended next steps on leadership development to advance the international education sector in Canada and to strengthen the capacity and innovation of its future leaders. 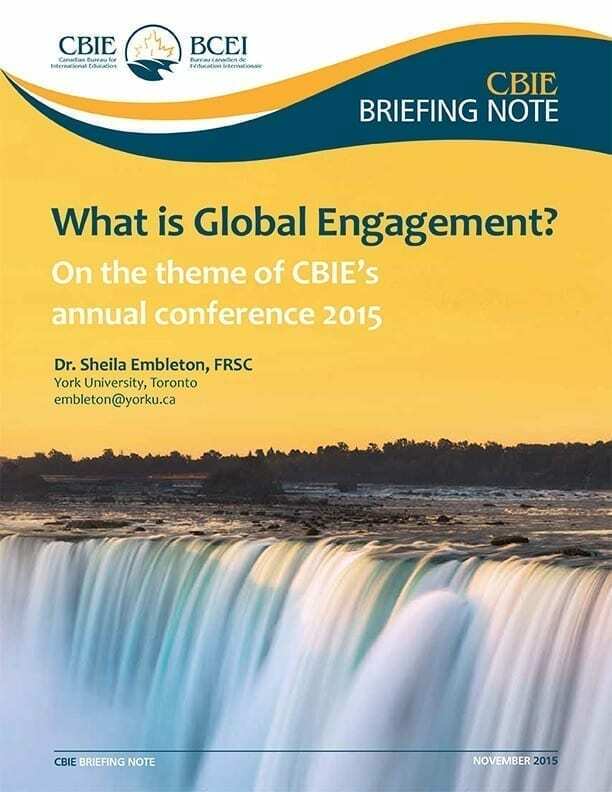 CBIE’s 2015 global report on international education in Canada. This brief offers a comprehensive definition of global engagement, and discusses why it is important to be globally engaged. 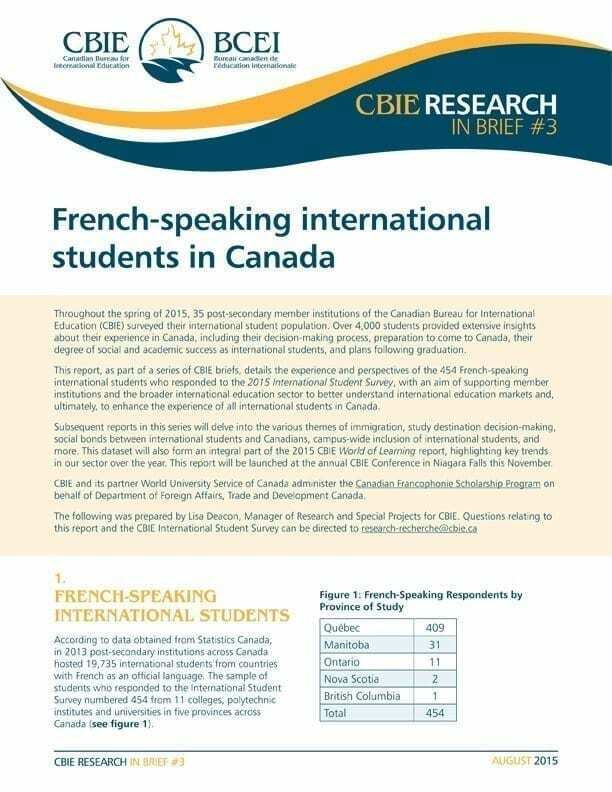 This brief details the experience and perspectives of the 454 French-speaking international students who responded to CBIE’s 2015 International Student Survey, with an aim of supporting members and the broader international education sector to better understand francophone international education markets and, ultimately, to enhance the experience of all international students in Canada. Click here to access a digital copy. 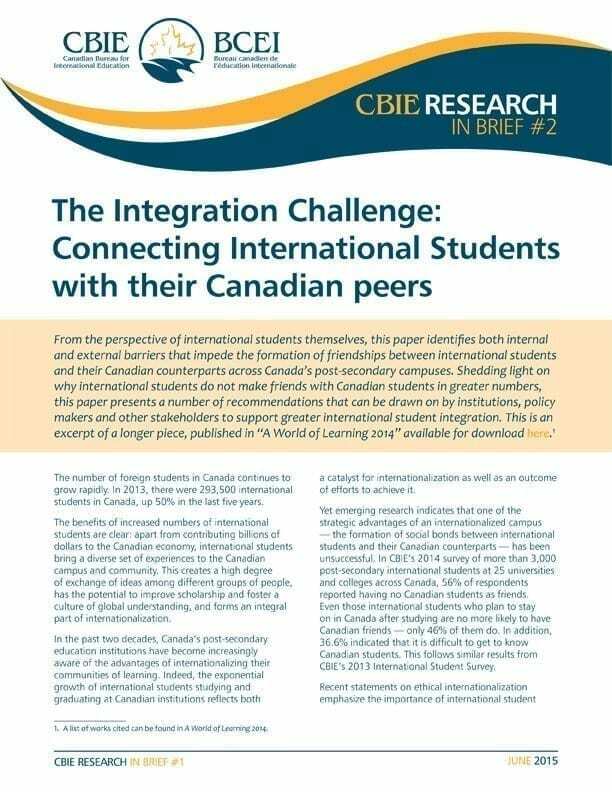 From the perspective of international students themselves, this paper identifies both internal and external barriers that impede the formation of friendships between international students and their Canadian counterparts across Canada’s post-secondary campuses. Click here to access a digital copy. This is an excerpt of a longer piece, published in A World of Learning 2014 available for download here. 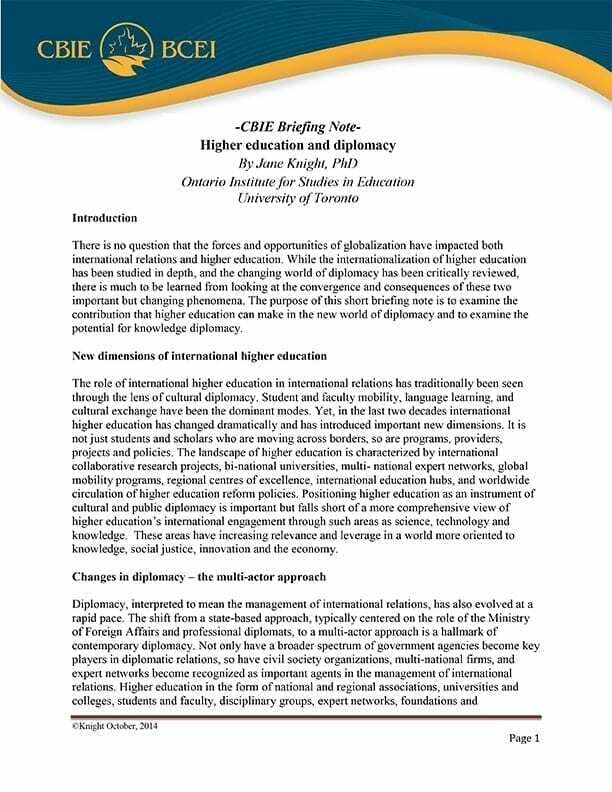 The purpose of this briefing note is to examine the contribution that higher education can make in the new world of diplomacy and to examine the potential for knowledge diplomacy. 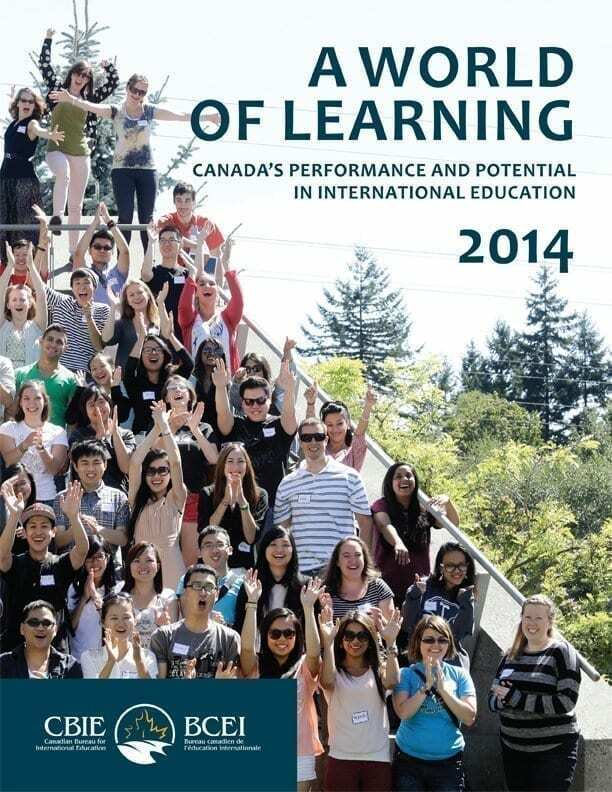 CBIE’s 2014 global report on international education in Canada. Click here to access a digital copy. 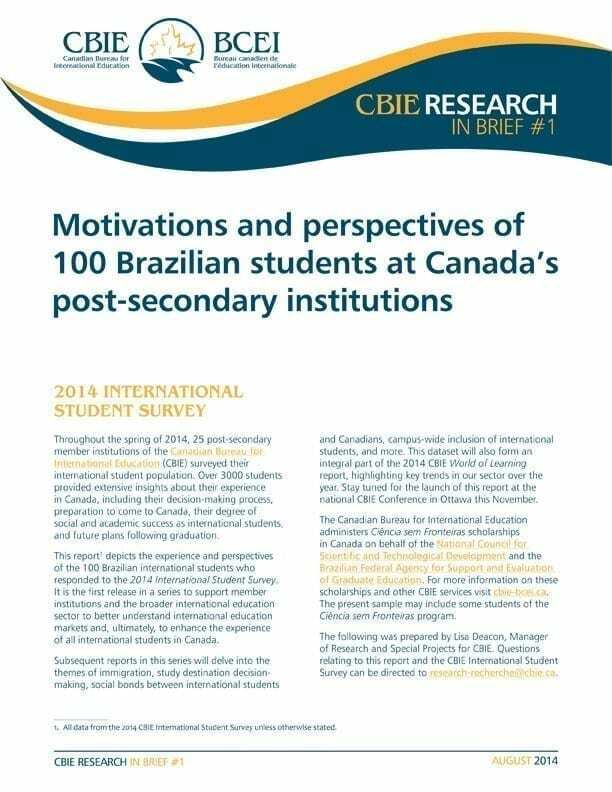 This brief details the experience and perspectives of 100 Brazilian international students who responded to CBIE’s 2014 International Student Survey. Click here to access a digital copy. 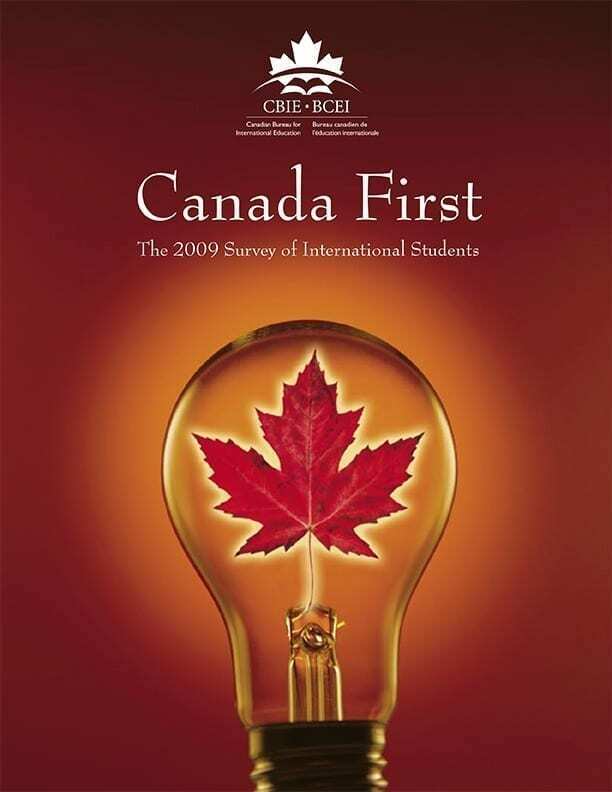 CBIE’s 2013 global report on international education in Canada. Click here to access a digital copy. This paper explores an area of emerging research on the impact of organizational culture on institutional strategies for internationalization. 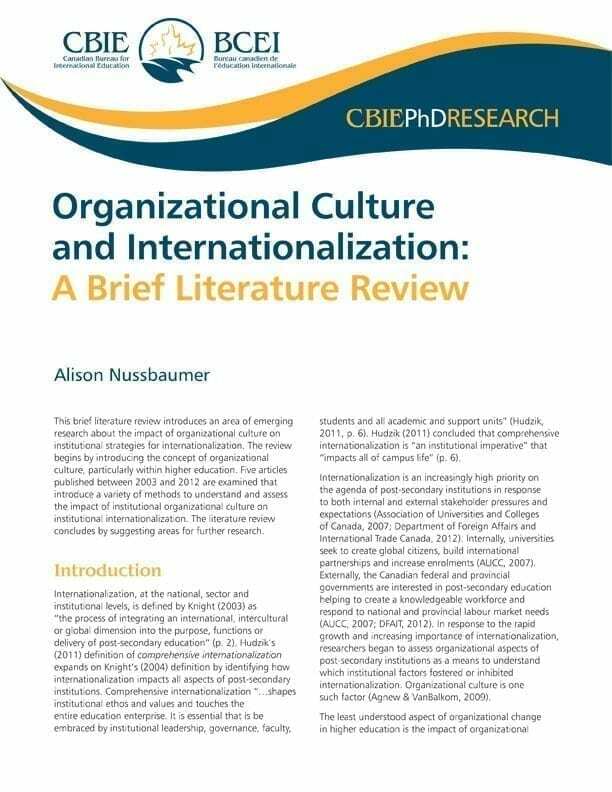 Nussbaumer examines the concept of organizational culture within higher education by reviewing five important articles that introduce methods to understand and assess the impact of organizational culture on institutional internationalization. Click here to access a digital copy. 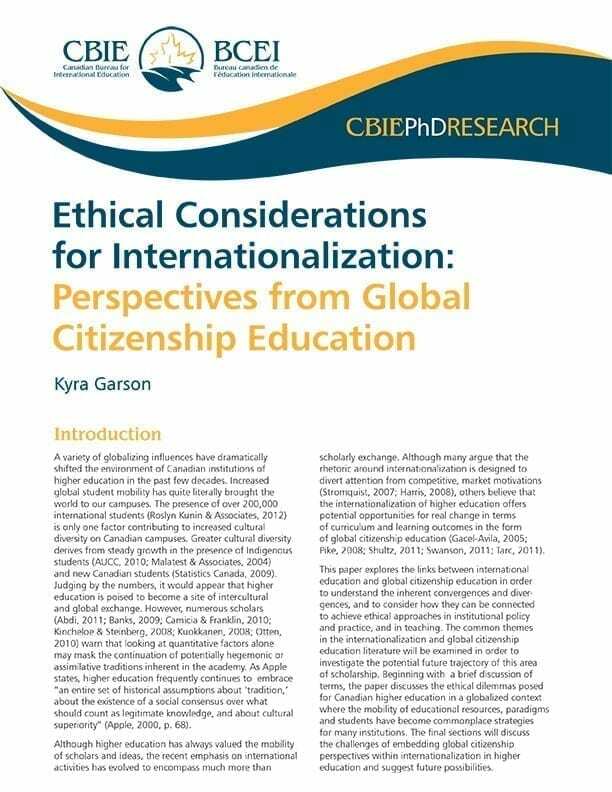 This paper explores the links between international education and global citizenship education in order to understand the inherent convergences and divergences, and to consider how they can be connected to achieve ethical approaches in institutional policy and practice, and in teaching. Click here to access a digital copy. 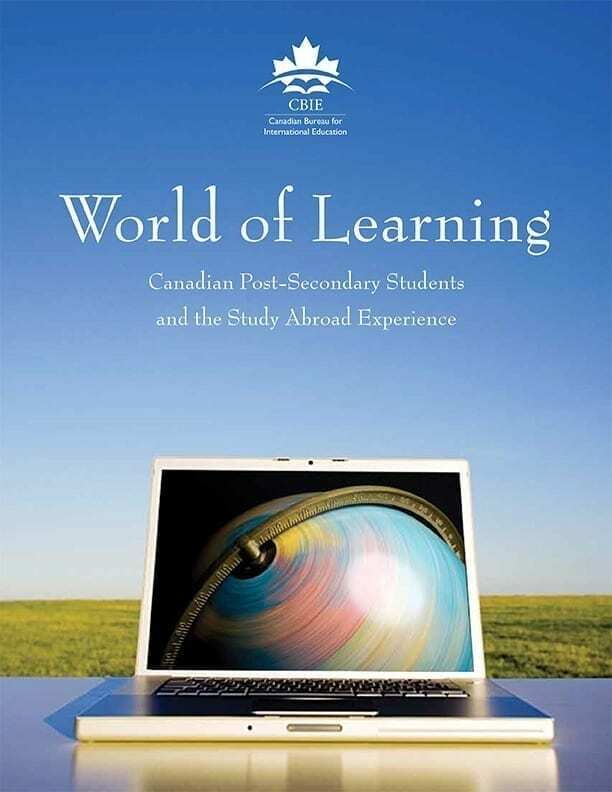 The inaugural edition of this annual report, A World of Learning 2012 explores the state of international education in Canada, taking an in-depth look at international students, study abroad by Canadian students, Canadian education overseas, as well as the overall internationalization landscape in Canada. 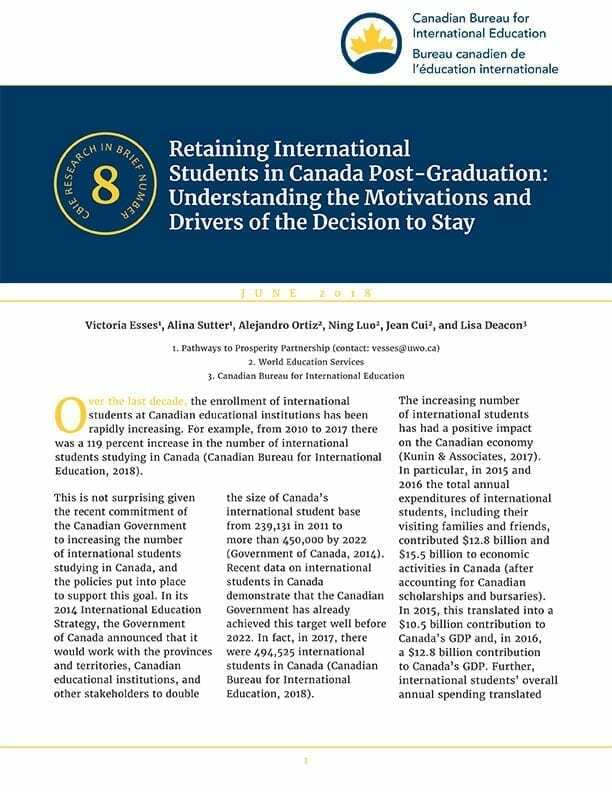 The report features results of an international student survey and case studies from member institutions, and examines options for taking Canada to a higher level as an international education destination, as well as the factors which could support or impede the country’s efforts. Click here to access a digital copy. This report addresses current international scholarship programs and strategies across the country and offers recommendations for the future. 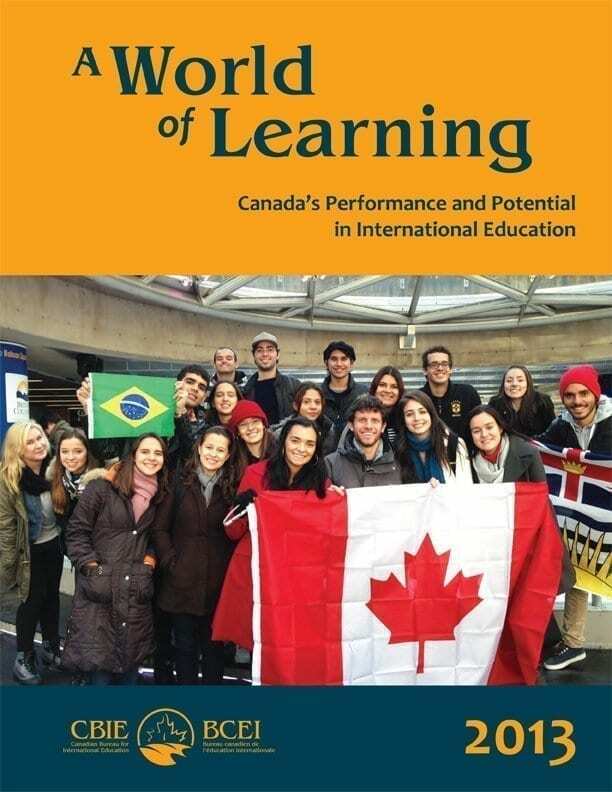 The authors suggest ways to position Canada for greater success in the internationalization of its higher education sector, to attract and retain international talent, and to encourage Canadian students to broaden their horizons through international study. Click here to access a digital copy. 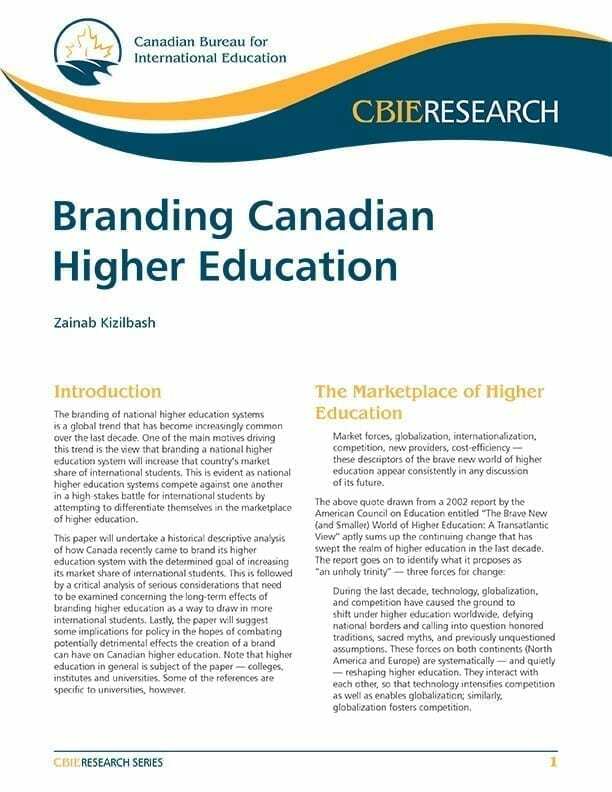 The branding of national higher education systems is a global trend that has become increasingly common over the last decade. One of the main motives driving this trend is the view that branding a national higher education system will increase that country’s market share of international students. This is evident as national higher education systems compete against one another in a high-stakes battle for international students by attempting to differentiate themselves in the marketplace of higher education. Click here to access a digital copy. CBIE’s satisfaction survey offers the views of 6,000 international students at colleges and universities across Canada. It is the fourth national satisfaction survey conducted by CBIE. Previous editions appeared in 1988, 1999 and 2004. Click here to access a digital copy. The rapidly increasing interconnectedness of the world has not only brought about a redefinition of what kind of society Canadians want for themselves and their children, but what kind of educational programs and opportunities Canadian colleges and universities should be offering students who, as graduates, will need to be internationally knowledgeable and inter-culturally competent within these new realities. 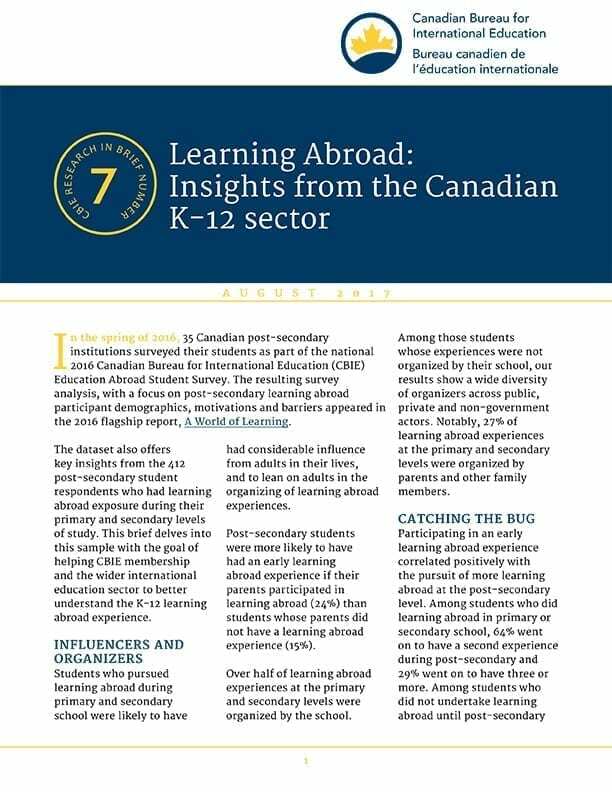 This seminal report on education abroad in Canada explores Canadian post-secondary students and the experience of study abroad. Click here to access a digital copy.